December – Goyal and Catherine attended the Christmas Concert and Dinner at Windsor Castle on 6th December and GMC donated GBP 800 to the Duke of Edinburgh’s Award and the London Mozart Players. The Duke of Edinburgh’s Award gives all young people the chance to develop skills for work and life, fulfil their potential and have a brighter future. Catherine is also a Silver Award holder. Learn more about the Duke of Edinburgh’s Award from their website. London Mozart Players is a British chamber orchestra founded in 1949. The LMP is the longest-established chamber orchestra in the UK and it has developed an extensive and highly regarded education, community and audience development programme, and is particularly committed to developing new audiences in outer London boroughs as well as rural areas across the nation. December – GMC has sponsored GBP 500 towards the launching of the catering department at the Tower Hamlet College. 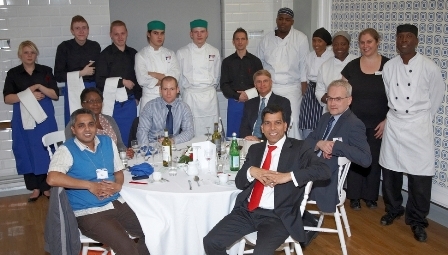 On 18th October, Students at the Catering and Hospitality department prepared, cooked and served a three-course dinner to the college’s governors, including Prem Goyal and management. The event marked the completion of the College’s brand new restaurant and refurbishment of its existing training kitchens. These new and updated facilities allow students to study and work in a professional, industry-standard environment, giving them the experience and skills they need to take into the workplace. November – GMC has sponsored GBP 400 to the People Care Association Christmas Day Party. People Care Association is a registered charity which has been established for 40 years. The charity organises a Christmas Day Party each year for 350 isolated elderly people in Southwark. November – GMC sponsored GBP 1,000 to the Mayor of Southwark’s Common Good Trust’s Float on the New Year’s Day Parade in London on 1st January 2012. The charity aims to provide assistance in a variety of forms to all those in need, either living or having links with the area covered by London Borough of Southwark. The money raised on the New Year’s Day Parade to go to helping the needy of the Borough of Southwark. Learn more about New Year’s Day Parade from their website. October – GMC CEO Prem Goyal joined fellow business leaders, political leaders and entrepreneurs at the Black Business Initiative Awards held at the Hilton Hotel, Tower Bridge. Around 250 guests enjoyed an evening of entertainment, delicious food, networking and a fashion show. Prem was presented with the Diaspora Community Honorary Award alongside former Labour Minister Tony Benn. While receiving the award, Prem noted that we could make London a better place to work and live for all people by building bridges among different communities; a lot of sustainable efforts are still needed so we can benefit fully from London’s diversity. Later, Prem presented John Charles of ‘Catering to Order’ with the Entrepreneur of the Year Award. Learn more about BBI from their website. at the Tower Hamlet College Annual Student Achievement Awards ceremony, which took place on 14 Sept. 5 GMC staff attended the ceremony. Tower Hamlet College offers a vast range of courses from BTECs and A Levels to short courses for 16-19 year olds and courses ranging from Teacher Training to short employability courses for adults. The college provides excellent support and superb facilities enabling students to progress on to higher education or into employment. Learn more about Tower Hamlet College from their website. September -Prem Goyal is attending the Macquarie Fast Bowlers Dinner this month. This Event is taking place to honour the greatest International Fast Bowlers of the 20th Century. The attendee list includes great bowlers such as Curtly Ambrose, Andre Caddick, Colin Croft and many, many more. This event is in aid of The Lord’s Taverners which is the official charity for recreational cricket and the UK’s leading youth cricket and disability sports charity. To find out more, visit The Lord’s Taverners website. 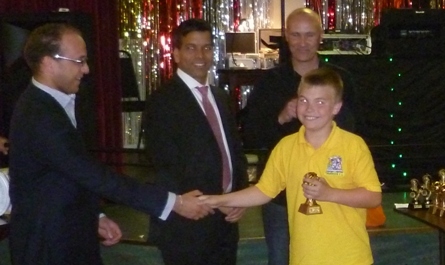 August – GMC sponsored GBP 600 to the Thurrock YFC under 12B team for their football kits again this year. Prem Goyal and Mouhcine Bourous have also participated in presenting trophies and medals at the award ceremony to the youths in recognition of their efforts.To find out more, visit the Thurrock Football Club website. August – GMC has sponsored GBP 100 to Catherine for participating in the Adidas Women’s 5k Challenge to raise money for the RedR. RedR is an international charity that improves the effectiveness of disaster relief, helping rebuild the lives of those affected. They do this by training relief workers and providing skilled professionals to humanitarian programmes worldwide. Learn more about the RedR from their website. 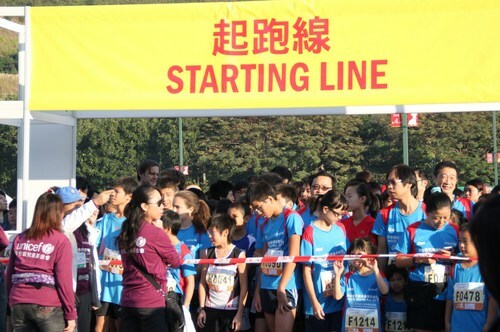 August – GMC has sponsored GBP 100 to Mandy Ng for participating in the 10k UNICEF Charity Run Hong Kong. The Hong Kong Committee for UNICEF is one of the 36 national committees for UNICEF, they organise fundraising and advocacy activities to provide financial support for UNICEF’s programmes across over 150 countries and territories to help children survive and thrive. Learn more about the UNICEF HK from their website. July – Prem Goyal attended the Guildhall School of Music and Drama Summer Gala on 12th July and GMC donated GBP 130 to the school’s scholarships fund. The Guildhall School of Music & Drama is one of Europe’s leading conservatories. Every year the school aims to provide financial help for its young musicians, actors and theatre technicians with awards from the Scholarships Fund. Awards are also made specifically in support of younger students attending Junior Guildhall. Learn more about the Guildhall School of Music and Drama from their website. July – GMC has sponsored GBP 100 to Clayton Wong for participating in the Longest Day Golf Challenge 2011 to raise money for the Macmillan Cancer Support. The Longest Day Golf Challenge is the most exhilarating golf event in the UK, participants have to play 72 holes, hit 300 shots and walk 20 miles- all in one day. Macmillan Cancer Support improves the lives of people affected by cancer by providing practical, medical and financial support for better cancer care. Learn more about the Macmillan Cancer Support from their website. 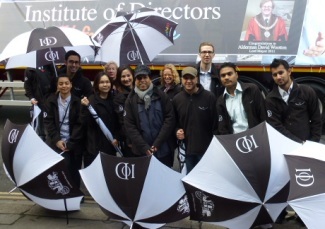 July – Prem Goyal has raised GBP 1000 to support the Institute of Directors Float Appeal at The Lord Mayor’s Show on 12 Nov 2011. The Lord Mayor’s Show is the world’s oldest civic procession. In the 21st century it is longer, grander and more splendid than ever. It winds through nearly 800 years of London’s history. The newly elected Mayor makes his way to the Royal Courts of Justice and pledge allegiance to the Crown. It is a day out for half a million people, with millions more watching on TV. To learn more about the Lord Mayor’s Show from their website. June – GMC donated GBP 475 to Spartak 78 YSC to sponsor trophies and medals for the 8th Annual Mini League Tournament and Football Fun Day, which was hosted by Spartak 78 YSC on Saturday June 11th at the Herberts Farm playing fields in Saffron Walden. 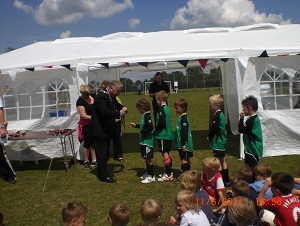 The Town Mayor and Mayoress of Saffron Walden presented the medals and trophies to the young footballers, making it a proud moment for everyone present. Furthermore, GMC team members Monika, Hafsa and Nitin volunteered their time and effort to contribute to the smooth running of the event. To find out more, please visit Spartak 78 YSC website. May – Prem Goyal and Catherine attended the Annual Jade Banquet at the Phoenix Palace Chinese Restaurant organised by the Chinese Welfare Trust. The Trust was established in 2008 to provide welfare services to Chinese people resident throughout the United Kingdom. Learn more about the Chinese Welfare Trust from their website. May – Prem Goyal and Catherine attended the Mayor of Southwark Charity Ball in aid of Macmillan Cancer Support on 14th May and GMC donated GBP 140 to the charity. Macmillan Cancer Support improves the lives of people affected by cancer by providing practical, medical and financial support for better cancer care.Learn more about the Macmillan Cancer Support from their website. April – GMC has sponsored GBP 100 to John Tyler, who also participated in the 2011 London Marathon to raise money for Cancer Research UK. Cancer Research has saved millions of lives with their groundbreaking work into preventing, diagnosing and treating cancer. The survival rates have doubled in the last 40 years and Cancer Research has been at the heart of this progress. To find out more,visit Cancer Research UK website. April – GMC has donated GBP of 228 to Lester Reeves for participating in the London Marathon to raise money for the Blackfriars Settlement Charity. This charity has been in existence for 124 years working with local people in North Lambeth and Southwork, particularly those who are disadvantaged economically or socially.Learn more about the from their website. April – GMC has sponsored GBP 300 to Sohail Janjuha for participating in the London Marathon to raise money for the Muscular Dystrophy Campaign. This campaign is amongst one of UK’s leading charities that focus on all muscle disease which make it very difficult for adults and children to carry out day to day activities. To find out more, visit Muscular Dystrophy Campaign website. April – Prem Goyal with one guest, attended the Lord Mayor’s Big Curry 2011 charity lunch at the Guildhall on 29 April. GMC has donated GBP 190. Money raised from the event went directly to the Current Operations Fund, which supports soldiers and their families affected by the conflicts in Afghanistan and Iraq. 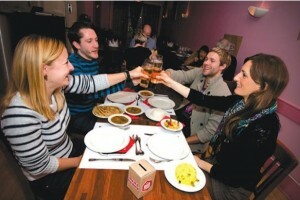 Learn more about The Lord Mayor’s Big Curry from their website. 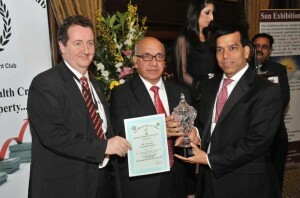 March – GMC CEO Prem Goyal joined fellow business leaders at the Indian Achievers Awards at the UK Parliament. The award ceremony admires leadership from different walks of life. 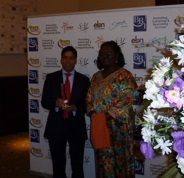 During the evening, Prem accepted the 2010 Young UK Entrepreneur Award by the Indo British Business Forum (IBBF). This award recognises leadership, vision and actions of people who are role models for upcoming generations. In his acceptance speech, Prem said that one of the most fulfilling parts of being an entrepreneur is creating hundreds of jobs and providing work and training opportunities for young people. He added that receiving this award will motivate him to keep growing his business, create more opportunities for our communities and share the secrets of starting a successful business with Londoners, especially young entrepreneurs. March – Prem Goyal sponsored GBP 150 to Macmillan Cancer Support and attended the Parliamentary Palace of Varieties event. This extraordinary dinner show took place at the Park Lane Hotel in Piccadilly, London. During this exclusive occasion, Lords and MPs were entertained by a range of talents to raise awareness of Macmillian. Learn more about Macmillan Cancer Support from their website. March – Prem Goyal and Catherine attended the Mikhail Gorbachev 80th Birthday Charitable Celebration Concert on 30th March 2011 and GMC donated GBP 390 to the Macmillan Cancer Support and Gorbachev Foundation. Macmillan Cancer Support improves the lives of people affected by cancer by providing practical, medical and financial support for better cancer care. Learn more about,visit Macmillan Cancer Support from their website.The Gorbachev Foundation is a non-governmental non-profit organisation founded by the former President of the USSR, Mikhail Gorbachev. It conducts research into social, economic and political problems of critical importance at the current stage in Russian and world history. The Foundation seeks to promote democratic values as well as moral and humanist principles in the life of society. 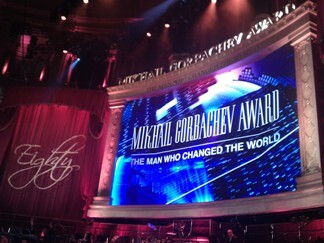 Learn more about the Gorbachev Foundation website. March – GMC sponsored GBP 100 to the Stepney Football Club; the Safer Neighbourhood Tournament (SNT) has been a great success in promoting diversity and sports in the local boroughs of London.To find out more, visit The Stepney Football Club website. March – Prem Goyal has donated 1035 GBP and attended the fundraising dinner event hosted at Cafe Spice Namaste in support of Time and Talent Association. This charity is based in Rotherhithe which has been helping local people with crucial support in the time of need since 1887. Learn more about Time and Talent Association from their website. March – Prem sponsored GBP 250 to Geeta Gupta, who will participate in the Eton sprint Triathlon to raise money for Pratham UK, which is a children’s charity based in India. This charity is the largest non-governmental children’s charity working to provide quality education to underprivileged children in rural and urban India. To find out more, visit Pratham UK website. February – GMC CEO, Prem Goyal, attended the Square Mile Salute, a charity fundraiser for wounded troops at Guildhall in the City of London. Networking with over 500 city professionals, Prem exchanged business views with Boris Johnson. GMC made a contribution of £1,200 towards the fundraiser. February – GMC sponsored GBP 300 to Sohail Janjuha’s, who has participated in the FOCUS challenge by undertaking a 6 day 300km cycle, climbing up to 650 metres a day through the mountainous Berber villages from Ourzazate to Skoura, for a charity called Focus Humanitarian Assistance which provides emergency relief for developing world countries.To find out more, visit Focus Humanitarian Assistance website. February – Prem Goyal donated GBP 100 to WAR Child, which is an international charity that protects children living in the world’s most dangerous war zones. Visit WAR Child from their website. 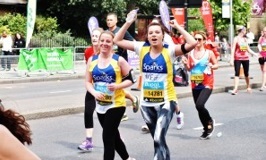 February – GMC has sponsored GBP 100 to Matthew Rickett, who will participate in the London Marathon to raise money for SPARKS. It is a children’s medical research charity which funds high quality medical research into childhood diseases to help all babies be born healthy and stay healthy. Learn more about SPARKS from their website. 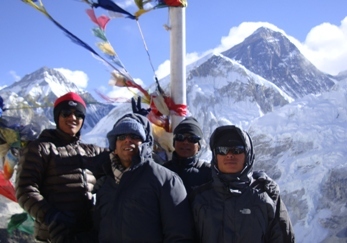 January – Prem Goyal and Catherine Ching completed a 12-day trek to Mount Everest Base Camp. During the whole trekking, they used designated routes and resting places to reduce trampling and other negative environmental impacts. Also they used locally owned lodges and local guides and porters to experience the local taste and culture making direct impact on the local livelihood. Money spent during the whole trip would be contributed directly to the local livelihood, women’s empowerment and environmental conservation. They also donated money, clothes and shoes. Furthermore, GMC will be sponsoring a local student to further his college education in Kathmandu. January – GMC donated GBP 250 to Kids and Prem Goyal will be attending the Kids 40th Birthday Dinner event at Battersea Power Station on 10th March 2011. Kids, is a well established charitable organisation which helps disabled children and their families in living a happy, healthy and active life. Visit Kids for more information. January– GMC CEO Prem Goyal was delighted and honoured to become a Freeman of the City of London and join an association and Guild with such an illustrious history and traditions, having been formed in 1942. Prem was bestowed this title in recognition of his entrepreneurial and charitable contributions to the City of London. He is looking forward to getting more involved and joining hands with other Guilds and Livery Companies in the UK to make the City of London and Britain proud. 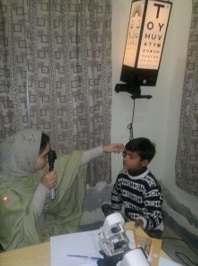 January – GMC Sponsored GBP 100 to the Ucare Foundation, formerly known as the Pakistan Foundation, which provides accessible, consistent, high quality healthcare and education to rural and deprived areas of Pakistan. It is currently, running campaigns such as Pakistan Flood, Kashmir Earthquake and Asia Tsunami relief. Learn more about the UCare Foundation from their website.